Lee Rich, Merv Adelson (seated) and Irwin Molasky (far left) of Lorimar Productions pose with the various cast members from 4 of their productions in 1979. Groups left to right are "Married: the First Year", "The Waltons" including show creator Earl Hamner, "Eight is Enough" and "Dallas". Lorimar Productions was the production company that produced The Waltons. It was started only a few years before it produced what would become the Waltons pilot - The Homecoming. At that time Lorimar was producing TV movies of the week. Irwin Molasky, Merv Adelson, and Lee Rich, who named the company by combining the name of Adelson's ex-wife, Lori, with Palomar Airport in San Diego, California. The Waltons defied many trends when it hit the airwaves. Starting in 1957 with The Real McCoys US television had undergone a "rural revolution", a shift towards situation comedies featuring naïve but noble characters straight from America's heartland. CBS was the network most associated with the trend, with series such as The Andy Griffith Show, The Beverly Hillbillies, Green Acres, Mister Ed, Petticoat Junction, and Hee Haw. They aired so many of these rural-themed shows that it jokingly became known as the "Country Broadcasting System." By the early Seventies though, audiences were changing. The Vietnam war and the "awakening" of America's youth was changing trends and many viewers, especially young ones, were rejecting [rural-themed] shows as irrelevant to modern times. Advertisers were now more interested in attacting this younger urban viewer demographic. This promted CBS executive Fred Silverman to initiate a "Rural Purge" from the airwaves. This was despite the significant popularity of many long running "Rural" themed shows. First off the air in 1970 was Petticoat Junction. It was replaced by The Mary Tyler Moore Show and baswed on it's rating success Green Acres, The Beverly Hillbillies, Mayberry R.F.D., Hee Haw, Lassie, The Glen Campbell Goodtime Hour and The Jim Nabors Hour were quick out the door and replaced with urban, cutting edge and socially relevant shows like All in the Family, and spin offs Maude and The Jeffersons. Other new shows that continued to purge the rural shows off the air included The Bob Newhart Show and M*A*S*H. Congress though expressed their displeasure with some of the changes and felt that some of the new shows were not particularly family-friendly. This prompted CBS to green light The Waltons a rural family drama for its fall 1972 schedule, but they scheduled it in what they hoped would be a death slot against popular series The Flip Wilson Show and The Mod Squad. This was with the hopes that poor ratings would provide reason for early cancellation. 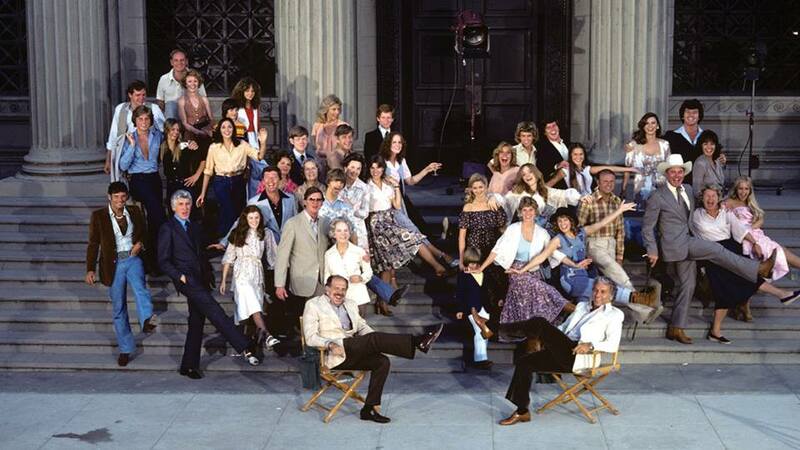 Instead though The Waltons defied the odds and rose the 2nd place behind All in the Family and it finished in the top thirty shows for seven of its nine years on the air. Lorimar's biggest hit was the primetime soap Dallas, it also went on to produce other prime time dramas such as Eight is Enough, Knots Landing, Falcon Crest (another creation by Earl Hamner) and Hunter. In the 1980s, Lorimar's output swung toward family-friendly sitcoms; including Mama's Family, Valerie/The Hogan Family, Perfect Strangers, Full House, Family Matters. Lorimar also procuced daytime shows The People's Court and Love Connection. The last two series to premiere under the Lorimar name were Time Trax and Babylon 5. Lorimar also produced a numer of movies including Being There, The Postman Always Rings Twice, An Officer and a Gentleman and Dangerous Liaisons. By 1986 with most of their shows shot and their offices located at the MGM lot Lorimar buys studio lot for $160 miliion. Today it is owned by Sony who purchased it after the Warner aquisition of Lorimar. Lorimar's success continued. By 1989 they were the number one supplier of television programs in the U.S. and had become known as the "Fifth Network" (following CBS, ABC, NBC and PBS). They had by now acquired 15% of Warner communications and were looking to purchase the whole company. In it's defence Warner merged with Time Inc. to become Time/Warner. Lee Rich decided to retire and Lorimar is sold to Time/Warner for $300 million. Lorimar continued as a entity and production company until July 1993 when the company and name was finally folded into Warner Bros. Television. Read a detailed history of Lorimar on this website devoted to other Earl Hamner series Falcon Crest. Read a recent Hollywood Reporter article about how the Lorimar spawned the Ruling HollywoodsExecutive.